The Light & Motion Sidekick Cold Shoe Tripod Mount Kit offers the flexibility to attach your Sidekick to your housings cold shoe or to a tripod. The Light & Motion Sidekick Cold Shoe Tripod Mount Kit uses the Cold Shoe mount to attach Sidekick to a camera. 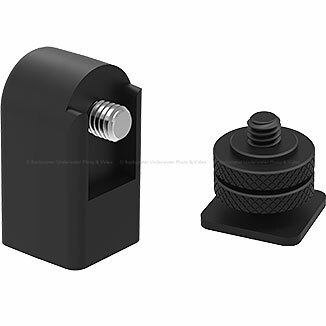 Or the Light & Motion Sidekick Cold Shoe Tripod Mount Kit uses the tripod mount to attach Sidekick to a tripod. It is a mount with a direct Sidekick connection that allows for mounting on cold shoes mounts & tripod mounts.